Thousands of people, including armed Islamic State Group members, have surrendered to U.S.-backed Syrian Democratic Forces (SDF), in eastern Syria. In a report from Al Jazeera, thousands of people, including armed fighters, have left the last area held by ISIL in Syria, a spokesperson for the US-backed Syrian Democratic Forces (SDF) said. Mostafa Bali of the SDF tweeted that about 3,000 people had come out of the village of Baghouz in eastern Syria on Monday through a humanitarian corridor established by the Kurdish-led group for those who choose to leave or surrender. Bali said among those who left was a large number of fighters of the Islamic State of Iraq and the Levant (ISIL or ISIS) group who "surrendered to our forces." According to a report from Reuters, "around 200 Islamic State members surrendered in Baghouz after a ferocious battle at the weekend, but around 1,000 may still be holding out, a spokesman for the U.S.-backed Syrian force battling them said on Monday." This came after the Syrian Democratic Forces (SDF) launched air strikes against the Islamic State Group in central Syria, the pro-Damascus al-Watan newspaper reported on Tuesday. According to TeleSUR, the Islamic State Group have been using "guerilla-warfare tactics" for four years, while the U.S.-led coalition (SDF) described them as the "most-hardened militants." AlJazeera reported that suspected fighters were moved to detention facilities for where they will be investigated. @mustefabali Slowing down the offensive in #Baghouz yesterday, we managed to evacuate about 3.000 ppl from ISIS pocket through the corridor we opened. A large number of Daesh jihadists surrendered to our forces among the same group overnight. A Trump official noted that the duties of the remaining troops include providing logistics, intelligence, surveillance, and necessary information for directing airstrikes, which falls outside the peacekeeping mission. The White House announced Thursday its plan to keep a small peacekeeping unit of troops in Syria. The statement retracts U.S. President Donald Trump's announcement in December, in which he declared victory over the Islamic State and said that he would withdraw all 2,000 forces from the country after four years of deployment. The announcement was made after a phone call between the U.S. president and president of Turkey Recep Tayyip Erdogan, in which the leaders agreed to maintain efforts to create a "safe zone" near the Turkish border. This action marks the second time Trump has come to a major decision regarding Syria after conversing with the Turkish president. White House Press Secretary Sarah Huckabee Sanders, in an address to the press, said the "small peacekeeping group of about 200 will remain in Syria for a period of time." Sanders, however, did not clarify where or how long the troops will remain in the region, or if they would be under the United Nations (UN) authority. The UN typically oversees peacekeeping missions in conflict zones. A Trump official noted that the duties of the remaining troops include providing logistics, intelligence, surveillance, and necessary information for directing airstrikes, which falls outside the peacekeeping mission. Peacekeeping tasks mainly reference maintaining cooperative relations between Turkey and Kurdish-led Surian Democratic Forces, who are the United States' primary ally in the fight against the Islamic State. An associate professor at the Near East South Asia Center for Security Studies and former Pentagon official, David Des Roches, charges that other motives, for the announcement, are afoot. "It's not a large number of forces. It's too small to be militarily significant. So it has to be political." Trump's announcement to withdraw troops in December garnered both internal and external criticism. Former defense secretary Jim Mattis, and special presidential envoy to the coalition fighting the Islamic State, Brett McGurk, both resigned in protest. 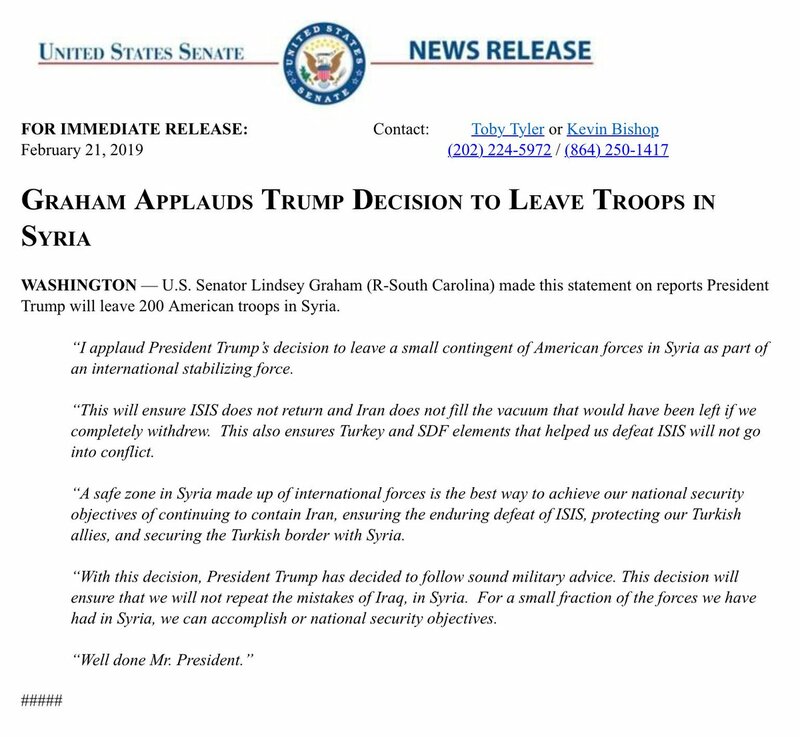 Additionally, Republican Senator Lindsey Graham raised concern of the potential threat of Iran or Russia filling the vacuum that would be created due to the absence of U.S. troops. European allies also threatened to leave the region if U.S. troops were pulled. The new announcement encourages France and Britain to keep troops in Syria. 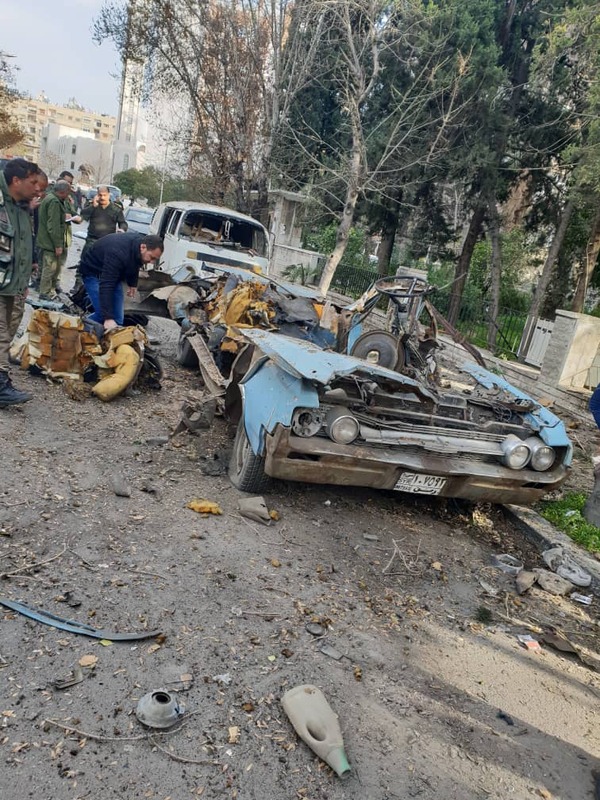 A blast has occurred in the Syrian capital of Damascus close to the Russian Embassy, the diplomatic mission has confirmed. The explosion has inflicted only material damage, according to SANA news agency. A car bomb detonated in the area, according to state TV. Other media outlets, however, suggest that the attack might have been carried out by a suicide bomber. The explosion has apparently caused only material damage, no casualties have been reported so far. Several government buildings, as well as the Embassy of Russia, are located in the vicinity of the area, where the blast occurred. The explosion occurred some 500 meters away from the Embassy, Russian mission confirmed, adding that its staff was not affected by the blast. A number of photos, purportedly showing the scene of the blast, have emerged online. The explosive device was apparently planted in an old blue car, which was badly damaged in the explosion. A powerful blast has hit the northern Syrian city of Manbij, which was recently threatened by Turkey over its Kurdish control. Several people were killed, with local sources claiming Kurdish-allied US soldiers were among the dead. The blast happened near a restaurant and market. Preliminary reports say at least six people were killed and 19 others injured by the explosion. Various sources on the ground claim that between two and five US soldiers are among the casualties, but this has yet to be confirmed. Footage from Manbij obtained by RT’s video agency Ruptly shows emergency vehicles and several US troops, presumably responding to the blast. Ruptly’s contributor on the ground said the US military ramped up security inside the city following the attack and put the city hospital, where victims have been transported, on lockdown. Photos and videos taken at the scene show a damaged building with broken windows and what appear to be blood stains on a column and several damaged cars. The US-led coalition stated it was “aware of open-source reports” on the blast, and said that it had conducted a routine Syrian patrol, but stopped short of confirming any casualties in the explosion. Four US soldiers were killed and three were injured, Reuters reported, citing an unnamed American official. Meanwhile, a helicopter apparently sent to the area by the US military was filmed by bystanders. Islamic State (IS, formerly ISIS) mouthpiece Al-Amaq said the terrorist group has claimed responsibility for the attack. Manbij is a strategically located city, which is at the center of a tense confrontation between the Kurds and Turkey, which considers the Kurdish fighters to be terrorists. Ankara has threatened to launch a military operation to kick them out of the city. The US, which supported Kurdish militias with arms and training while they were focusing on fighting jihadist forces, is now in the process of withdrawing its troops from Kurdish-controlled parts of Syria. The promised pullout would take time, however, and in practice US soldiers continue missions on the ground. DAMASCUS (Reuters) - In the National Museum of Damascus, archaeologist Muntajab Youssef works on an ancient stone bust from Palmyra, one of hundreds of artifacts his team is painstakingly restoring after they were damaged by Islamic State. Centuries-old statues and sculptures were wrecked by the jihadists when they twice seized control of the old city in central Syria during the country’s war, which will go into its ninth year in March. The 1,800-year-old bust of a bejeweled and richly clothed woman, The Beauty of Palmyra, was damaged during the first offensive on the city by Islamic State fighters in 2015. Mamoun Abdulkarim, the former Head of Syrian Antiquities, said that in some cases broken artifacts were transported in empty ammunition boxes provided by the Syrian army in Palmyra. How many artifacts there are in total is difficult to say, given the state they were found in. The lack of documentation for the artifacts also adds to the restoration challenge. “A big part of the documentation in the Palmyra museum, was damaged with the antiquities and computers,” archaeologist Raed Abbas said. Cairo, Egypt: Secretary of State Mike Pompeo said Thursday that a full US troop withdrawal from Syria announced by President Donald Trump last month will go ahead despite widespread criticism. The US top diplomat made his remarks while on a whistlestop tour of the Middle East to address the concerns of regional allies about the surprise pullout plan. "President Trump's decision to withdraw our troops has been made. We will do that," Pompeo told a joint press conference in Cairo with Egyptian Foreign Minister Sameh Shoukry. Earlier this week, US National Security Advisor John Bolton laid out conditions for the pullout, including the defeat of the Islamic State group in Syria and gurantees for the safety of Washington's Kurdish allies in the campaign, who have been threatened with an imminent offensive by Turkey. Bolton's comments were widely seen as backtracking on Trump's announcement. But Pompeo insisted the two statements were entirely consistent. "There is no contradiction whatsoever. This is a story made up by the media," said Pompeo, underscoring Washington's continuing commitment to preventing any resurgence by IS. From Cairo, Pompeo is scheduled to head to the capitals of the six Gulf Arab states to make his case. The Bahraini embassy in Damascus is open again, the Gulf nation announced on Friday, a day after a similar move by the UAE. It seems Saudi Arabia and its allies are ready to acknowledge Syria’s victory in the war. Early in the multifaceted Syrian conflict, which involved hostilities between various domestic forces and a strong influx of foreign fighters, several Gulf Arab states shut down their diplomatic missions in Syria. The country was also expelled from the Arab League in 2011, as Riyadh and Doha backed anti-government Sunni forces trying to topple the Alawite-dominated government in Damascus. Now the diplomatic ties are being restored. On Friday, Bahrain’s Foreign Ministry released a statement, which stressed the importance of continued relations with Syria and the “the Arab role” in preserving Syria’s independence. “Syria is a major Arab country in the region, we did not cut ties and it did not do so ... We stand with it in protecting its sovereignty and its territory from any violation,” tweeted later Bahraini Foreign Minister Khalid bin Ahmed Al Khalifa. Bahrain is a small island nation that hosts US Fifth Fleet, which had to call in Saudi troops in 2011 to quash Shiite mass protests, which started as part of the so-called “Arab Spring”. Earlier on Thursday, the UAE’s embassy in Damascus was reopened in a flag-raising ceremony almost eight years after its closure. This seems to be a continuation of a normalization trend started earlier in December by a visit of the Sudanese President Omar Bashir to Damascus. There are also numerous if unconfirmed speculations that the Arab League is about to readmit Syria. Also on rt.com Arab states are making nice with Assad’s Syria. Will the West follow suit? Considering Bahrain’s close relations to Riyadh, it appears Saudi Arabia and its allies, who were once bent on seeing the government in Damascus toppled, are not expecting this to come anytime soon. Re-engaging it diplomatically is a logical step for mending the ties damaged during earlier. Top diplomats from Russia, Turkey and Iran have agreed to ensure that a 150-strong committee to draft a new Syrian constitution will convene for the first time early next year as they wrapped up a meeting in Geneva on Tuesday. “We have agreed to take efforts aimed at convening the first session of the Syrian constitution committee early next year. These steps will lead to the launch of a viable and lasting Syrian-owned, Syrian-led, UN-facilitated political process,” Russian Foreign Minister Sergey Lavrov said in a statement following the meeting hosted by UN Special Envoy for Syria Staffan de Mistura. Also on rt.com Sochi or Vienna: Which peace plan offers best solution for Syria? The agreement, which could pave the way for political reconciliation in the war-ravaged country, was struck between Lavrov, Turkish Foreign Minister Mevlut Cavusoglu, and Iranian Foreign Minister Javad Zarif. The creation of the 150-member body was first envisaged during a UN-backed summit in Sochi last January, which reinvigorated the stale Geneva peace process. However, efforts had been without a major breakthrough due the parties’ inability to agree on the composition of the committee. The body will consist of 50 representatives from the Syrian government, 50 representatives from the opposition, and the remaining 50 are intended to be “independent” delegates of civil society chosen by the UN. The latter has become a bone of contention, with Damascus reportedly opposing some of the candidates. The list has not been finalized as of yet, but the trio of Russia, Turkey and Iran is nearing a mutually acceptable solution, Cavusoglu said after the meeting. “As guarantor states, we are working together with the UN on this issue. We are gradually moving towards the finish line,” he said. Cavusoglu stated earlier that Turkey will work with Syrian President Bashar Assad if he remains in power after “very credible, transparent, democratic and fair” elections are carried out, which is the ultimate goal of the constitutional committee. It was hoped that the committee would convene before Mistura, who is stepping down in December, leaves his post. Speaking after the meeting, the outgoing special envoy wasn’t overly optimistic, however, saying that “there is an extra mile to go” before having a balanced and credible body tasked with drafting a constitution. Meanwhile, the US – which has so far been wary of the possibility of intra-Syrian reconciliation – seems to be taking a less hawkish approach, with its special representative in Syria, James Jeffrey, recently saying that it doesn’t want to topple Assad anymore. “We want to see a regime that is fundamentally different. It’s not regime change – we’re not trying to get rid of Assad,” Jeffrey said at the Atlantic Council meeting on Monday. This doesn’t mean that the US has actually abandoned its plans to dislodge the Syrian president, however, according to Joshua Landis, director of the Center for Middle East Studies at the University of Oklahoma. Instead, it would merely prefer to do so without spilling blood. “The Americans are counting on this committee’s constitution change and [the] election overseen by the UN, which will change the regime peacefully and bring about a peaceful settlement in America’s favor,” he argued. Landis predicted that since this is “unlikely to happen,” the US will maintain a presence in Syria until it occurs. “That could mean that America is an open-ended force in Syria,” he said.